In this practice test you will be required to answer all 12 questions about seat belts / restraints from the Driver Knowledge Test Question Bank. Only the driver and front seat passenger. Not wearing the available seat belt. Save lives and prevent injury. Do not have to be used in the rear seat. Are not necessary for good drivers. Must always be worn properly, and adjusted tightly. Are only needed on long trips. Are only needed on short trips. Should be fitted according to the manufacturers' instructions. Are not as safe as holding a child in your arms. Need only be used if the child wants to sleep. You are driving a vehicle that only has a seat belt for the driver. 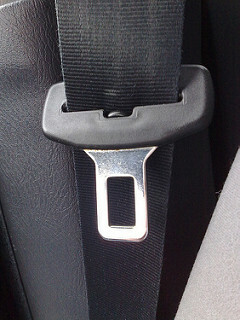 To reduce the danger of being in a vehicle without a seat belt, where is the best place for passengers to sit? In the front seat sharing your seat belt. Tell them the car has seat belts and they should wear them. Say nothing because it's the passengers' responsibility to wear their seat belts. Drive slower than you normally would so the passengers are safe. You have a baby restraint properly fitted to your vehicle. You have enough seat belts for all the passengers, including the baby. Your driver's licence permits you to carry children under the age of twelve months. You want to fit a baby restraint to your car. What should you secure the restraint to? An anchorage point designed for a baby restraint. Any seat belt in the back or front of the car. Only at the back using the seat belt provided. You give a friend and her 12 year old son a lift. Your friend sits in the front and her son gets in the back. The boy does not put his seat belt on. By law, who has to make sure the child wears his seat belt? You do, because you are the driver. Your friend does because she is the parent. The child does because it is always the passenger's responsibility. By law, all occupants of a car (unless exempt) need to be restrained by a properly fitted and adjusted seat belt or a child restraint. Occupants in a car fitted with airbags are not required to wear a seat belt. Seat belts and child restraints are only required on short trips.